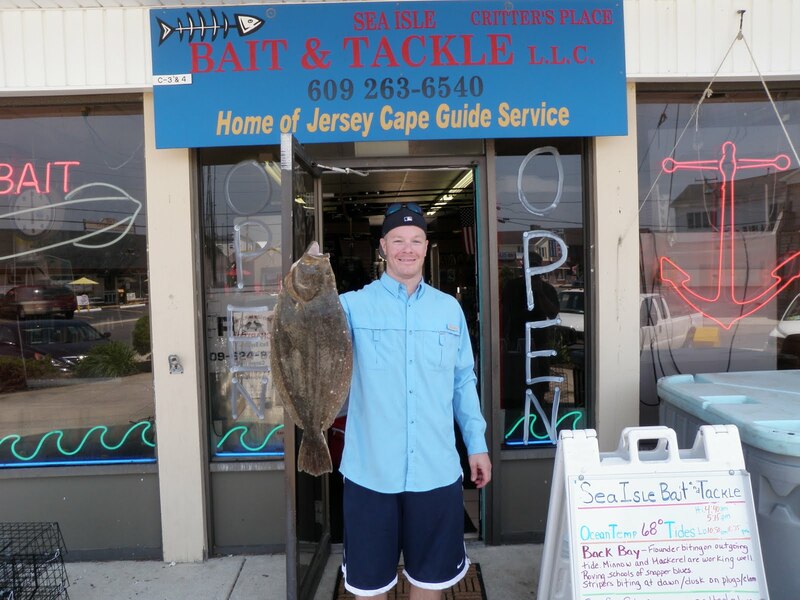 Chris Salstrom of Mantua NJ just brought this nice 6 Lb 1 oz flatty in for us to see. He got it in Ludlum’s bay with a mullet strip. He had several other nice fish but all just a little short. Flounder fishing is really starting to get hot so get out there and fish on this beautiful weekend. We will be open from 5am 9pm Friday and Saturday 5-6 Sunday 5-7 Memorial day. We are proud to be a part of 2011 Townsends Inlet Reef Fluke Tournament. For a 20.00 reef donation you will receive a tee shirt and be entered in the 2011 flounder tourney. The tournament will take place on June 4 starting at 5am. All proceeds benefit the TI reef. No monetary awards, just bragging rights!! Stop by the shop for more details. What a weekend to fish. There has been a steady bite of stripers with the occasional black drum. Even with the shortage of live clams in the Cape May county area people switched over to salted frozen clams and kept on catching. The kingfish bite in the surf has also been picking up. 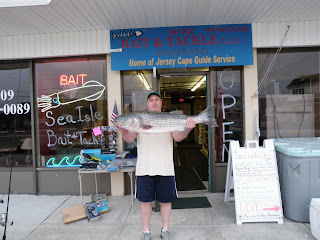 The inlet has been producing stripers and drum with the blues showing up. Blues have been taking spoons with the bait of choice being mullet and mackerel. In the bay the flounder bite has increased with the warmer water Saturday. We had several boats with 2 anglers catching up to and above six keepers. The best bite was in the afternoon with the outgoing tide. The baits of choice have been GULP, live minnows and mackerel. The stripers in the back bay have been hitting poppers and swimming plugs more consistently with the increased water temp but the people chunking clams are still reporting the best numbers. There have been many good reports of the drum biting down in the Delaware bay. If the weather is fit we receive shipments of bait/clams on Tuesday and Friday. If you need bushels of clams, flats of butterfish or cans of chum let us know early and if we have room we can order extra for you (609) 263-6540 or seaislebaitandtackle@gmail.com . Our hours are Monday thru Thursday 5am 7pm, Friday and Saturday 5am- 9pm and 5 am- 6pm Sunday.